A spooky black velvet cupcake with the warm pumpkin spices like cinnamon, ginger, nutmeg, clove and all spice then topped with a bloody cream cheese icing. Another creepy and spooky recipe for my favorite time of the year, Halloween. I have finally put out 80 % of Halloween decoration out, normally I have it out in September but I've been lazy. These cupcakes are a little of a trick or treat. They look really dark so you may think it is maybe burnt or a bitter dark chocolate but they are not. They're sweet. Another trick or treat element is the kick of warm pumpkin spices, so you may not think of the spices being in a chocolate cupcake. But cinnamon and chocolate go hand and hand. I believe cinnamon, ginger, nutmeg, clove and nutmeg with the chocolate go great together. All of these flavors play so great together, its was like a party in mouth when I took a bite from one of them. 1. Preheat oven to 325 degrees and put cupcake liners into the tin. 2. In a medium bowl, whisk together flour, cocoa powder, salt, baking soda, and baking powder. Set aside. In a larger bowl, cream together butter and sugar until light and fluffy, about 3 minutes. Scrap the side and add in the pumpkin spices. Mix until just incorporated. 3. Add in eggs and vanilla extract then add in a 1/3 of the flour mixture. Mix until flour is slightly dap then add in 1/3 of the buttermilk, vinegar, 2 tablespoons of the vegetable oil. Mix until the flour is slight wet. 4. Alternate the flour mixture, buttermilk and vegetable oil. Starting and ending with the flour. Fold the last of the flour mixture and let the batter sit 15 minutes. 5. Scoop the batter out and fill the cup 3/4 way full. Bake in the oven for 20 to 25 minutes or until a toothpick comes clean .Remove from the oven and let cool on a wired rack. 6. Just before you are going to dip the cupcakes, beat together cream cheese and vanilla bean paste for about 2 minutes. Add in salt and slowly add in confectioners' sugar then warm milk and food coloring. Yum! This looks delicious! I'm adding this to my fall treats! Oh my goodness, love cream cheese in my baking. These are sure to be a hit with our girls! I didn’t know they made black cocoa powder. I love red velvet, so I’m sure these are amazing! And fall festive! Wow, this recipe looks really delicious! I was looking forward to having a Halloween party this year that these would be perfect at. But since I'll probably still be recovering from giving birth, I'm just going to have to make them for myself! These look great! I love anything with pumpkin spice and love the super-bright icing! You are so right! Cinnamon and chocolate go amazing together! These look so yummy! The mixture of spices with the chocolate also sounds different than your average cupcake, and with the cream cheese icing, I'm sure these are a hit! These look so good! And love the look of them as well. Perfect for a Halloween party! What a great idea. I bet these would be a big hit at a Halloween party. These are seriously THE perfect Halloween dish to bring to a party. I love how you put the frosting over the side, kinda scares me, haha. Oooh, these look so good! I love pumpkin desserts! These look delicious. So ready for Halloween! These are so perfect for Halloween. They look really good too. I'm not such a halloween-fan, however, the cup cakes sound very yummy - although I'd choose a different decoration. And I disagree: I find these spices in a chocolate dough very good....the smell alone makes me all dreamy! Oh these cupcakes looks so good! I want one now! hahah I'm loving these halloween themed cakes! i totally saw it as blood first of all and the way you've dripped it over the cakes - great idea!! This is one of those things that I would try to make and end up with icing all over the house! This recipe may just be in my next dessert binge. These look so scrumptious! I can't wait for Halloween, it's my favorite holiday! Wow these look so yummy! I need to try these for Halloween. This is so creative. I'm sure that this will be an awesome Halloween treat. 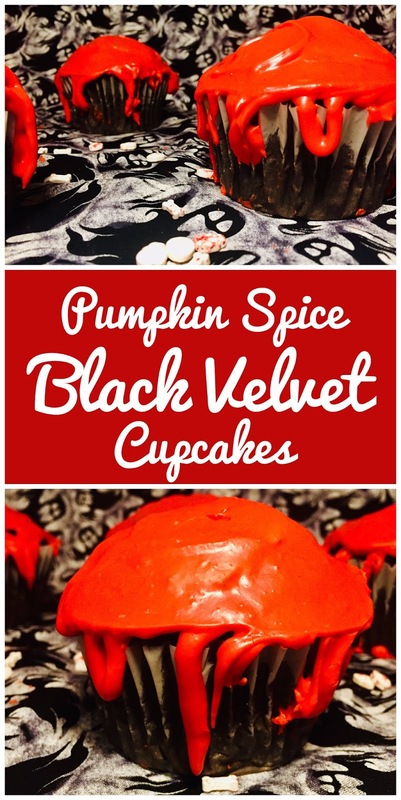 I am obsessed with velvet cake and Halloween, these are so perfect! Looks delicious! This looks so delicious, I will definitely have to try these with the kids! Talk about a Halloween treat that kids will LOVE! Thank you for the recipe!! These sound super yummy. I love pumpkin spice!! This is such a fun and creative recipe! Definitely a good one for Halloween! Yummy! These sound so good and look so perfect for Halloween! These doesn't only look perfect for Halloween, they actually sound pretty tasty too! These would be great for a Halloween party! Thanks! These look so cute! I still have yet to make a fall treat! these look so good and perfect for Halloween! The bright color is so suited for Halloween. Great pics. I must try making these. All of the components of the cupcake make so much sense to me. I love chocolate mixed with the warm spices that marry with a pumpkin (no pre-nup needed). The bloody cream cheese icing is the perfect touch for Halloween! Ooo... what festive Halloween cupcakes! I'd like to take a bite of one right now! What a gooey and oozey way to eat that pumpkin goodness on halloween. I am all for cupcakes, I literally just eat 4 today. I really need to try your recipe. These sound really yummy and are perfect for Halloween! Lucy, you just had to show me these decadent cupcakes when I'm currently on a diet. LOL! I really want to eat all of those in the picture and they look perfect for Halloween - I may need to go off my diet for an afternoon for these. Thanks so much for sharing! Oh! I love these! They look so creepy, yet delicious! Halloween is so fun and brings out all kinds of creativity! OMG this recipe looks really delicious!! That color is so attractive to me. Thank you for sharing all the ingredients and the step by step method on how to prepare it. Wonderful sounding flavor combinations. Perfect recipe for the upcoming Halloween holiday. They look so good, love the colour and how right for Halloween they are. Those cupcakes are spooky. The bright red is great for the season. I love the idea of the pumpkin pie spices. ooo yummy! This is perfect for a Halloween party! Love these. They actually look delicious and perfectly spooky! Yum!! How genius to do a black velvet cake! I've never heard of that. Those flavors also sound delicious! Oh, these look amazing for spooky parties! So cute! What an interesting spin on red velvet cake! Black velvet sounds so tasty and mysterious! And perfect for Halloween with the red icing.